Manufacturing in the apparel sector continues to diversify across Asia as companies look for alternative sourcing markets and balance the variables of cost, quality, capacity, speed, and risk, while achieving responsible sourcing objectives. ELEVATE conducts over 12,000 audits a year, primarily in Asia in the apparel, textiles, retail, consumer goods and electronics sectors. 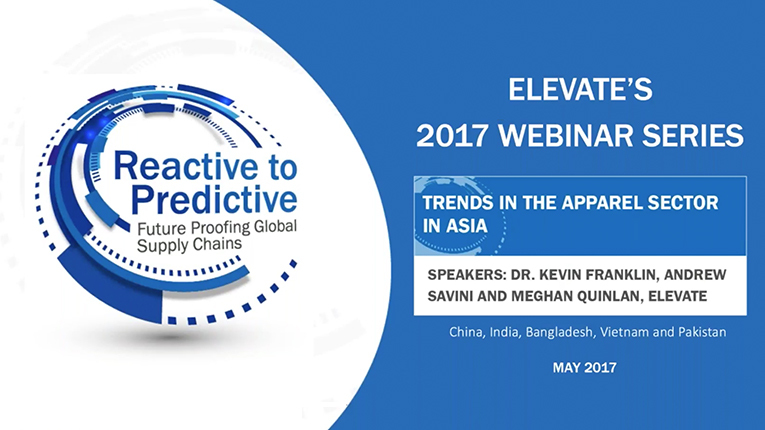 In our webinar, Trends in the Apparel Sector in Asia, we draw on the findings from these audits and related analysis from ELEVATE’s worker surveys, eLearning and other sources to formulate a rich picture of business risk, opportunity and impact.